Description: Molded plastic oval dome. 5” tall x 5” long x 2-7/8” wide x 1/8” thick. Used on some small German clocks. Good for display for other clocks & small treasures. Special buy. Regularly $18.00/each. While supplies last. 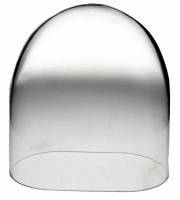 Description: Economical crystal clear acrylic dome with a brass hook on a black acrylic base. 3-1/2" diameter x 4-3/4" tall. 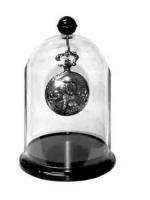 Acrylic Watch Display Dome With Base 4" X 5-1/2"
Description: Economical crystal clear acrylic dome with a brass hook on a black acrylic base. 4" diameter x 5-1/2" tall.